From time-to-time, you might encounter issues/problems in using CM/ECF. These problems can have causes ranging from a "bug" in the system to a problem with your browser. The list below describes the most common of these and explains how to overcome them. This list will be updated as new issues arise. The Maintain Your ECF Account option does not display in your Utilities Menu - or anytime there is missing items on a screen. the "If you enter additional addresses, please check "additional addresses" message. Email address change appears to have failed! 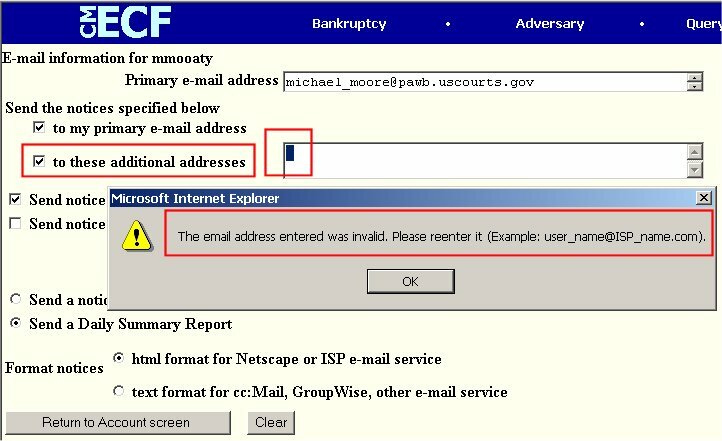 Forcing a retroactive change of email address to all cases. Getting the error message "The proper format for the social security number is 111-22-3333" when trying to submit from the Maintain User Account screen. Miscellaneous problems when attempting to work in the system. After entering an email address as your primary and/or secondary address, you will sometimes get this error message. It does not necessarily mean that the email address you entered was itself invalid! Most often the message is triggered by the existence of non-displayed characters in one of the email boxes - primary or additional. Here we see the error message displayed after clicking on the Return to Account screen button. Also note that the "to these additional addresses" box is sometimes checked and, a small area in the email box for additional addresses is highlighted. This is not always the case, but is common when this error message is encountered. This error message is triggered as a result of "non-displayable" characters existing in either the primary of additional address boxes. It is these characters that make the email address invalid. Again, this message could be generated upon clicking on the Return to Account screen button. Click on the next Submit button. Return to the Topics in Alphabetical Order page.